Many businesses are interested in storing their content in an online storage solution that makes it easy to access, manage or share it from any location with any device. They must also ensure that their content remains secure and that the process of cloud storage adoption is non-disruptive. Finally, they must make sure that the solution satisfies all the BASIC cloud storage use case. These include backup, access, synchronization, identity management and collaboration. Gladinet Cloud Team Edition addresses concerns about the ease of migration and provides a simple, secure, multi-device access model for online storage. It further supports the BASIC cloud storage use cases, works with most popular public cloud storage services and can be configured to leverage any pre-existing cloud storage account. Gladinet Cloud Team Edition provides users with familiar access methods (mapped drives, file shares, etc…) from a web browser, desktop client, mobile device or file server. For example, Remote users can leverage the desktop, mobile and web clients while on-premise users have the additional option of clientless access through their file server. 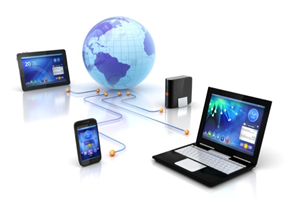 Remote users can also use their mobile devices to access on-premise file server content without a virtual private network (VPN). Gladinet Cloud makes it easy for teams to work on the same content from multiple locations. For example, globally accessible team folders may be defined with Active Directory based access controls and distributed file locking. Gladinet Cloud allows team members to securely share files and folders with anyone, as permitted by the administrator. It automatically creates versioned backups of attached folders or can create snapshot backups. 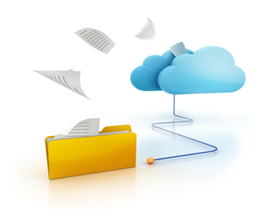 Folders can also be synchronized with the cloud so that changes made anywhere are readily available. Unlike other solutions, you are not limited to a single synchronization folder which forces reorganization of your file hierarchy. For example, an IT admin can install Gladinet Cloud Server, one of the Gladinet Cloud access clients, on a file server and then attach existing folders and file shares to HP Cloud Object Storage. On-Premise users can continue to access the file shares without interruption as the attached folder is synchronized to the cloud. Attaching a folder to the cloud also means that it will immediately become accessible from all clients as it is synchronized. This is a truly unique technology that allows folder browsing and random file access before the synchronization is complete! The reverse is also true. Using Gladinet Cloud Server, cloud storage can be attached to a file server allowing multiple on-premise users to connect to the cloud through file shares on the LAN. Gladinet Cloud enables online storage access for users by using the file system as a proxy to the cloud. In this way, users access cloud storage using familiar applications and paradigms. For example, they will be able to access online storage using Windows Explorer or Mac Finder on their PCs and laptops or mount a file share presented by Gladinet Cloud Server. Gladinet Cloud is administered from a web portal. This web portal can also be used as a rich access interface for end users. The web portal can also be used on clients that do not have a native online storage client for the Gladinet Cloud. And based on Gladinet Cloud’s HTML 5 support, users will be able to drag and drop files directly into the browser and perform other rich operations. Gladinet Cloud attaches on-premise folders from multiple servers in multiple locations. The file structures under these folders will appear in a unified view under the root folder of Gladinet, providing a unified view across multiple sites. Gladinet Cloud provides its own user management or users can be managed through tight integration with Active Directory. Multiple team members may be designated as delegated administrators. For large enterprises and service providers, Gladinet offers custom development services to create branded access solutions. For more information, send an email to partner@gladinet.com.